Before we get started talking about your writing, tell us a little about yourself, where you’re from, what you do for a living (if you’re not a full-time writer) what hobbies you have, etc. Whatever you’d like to share. I am a right-brain soul trapped in a left-brain body. What I mean by that is I’m very good at breaking down complex things to their component parts and understanding how they work, but my creative side (the right-brain) has been denied for far too long and is screaming to be let loose. My day job takes me into the world of Accounting. It wasn’t my first choice in a career, I wanted to be an astrophysicist, but it has worked out. I still like to dabble in sky-watching in the mountains of New Hampshire far from city lights. It helps me clear my mind when I gaze out at the Milky Way and wonder what or who is out there. I like to crochet afghans, but I haven’t had the time recently. I have the yarn at the ready and once I can get my characters to type their stories I can get them started on the afghans. I’ve always had different stories playing in my head. I’d write the ideas down, but actually creating the story structure took some time for me to discover. I took a mystery writing class at Gotham Writing. Everything just clicked and the stories flowed onto the blank page. Finding the time to write. I have a more than full time job that oftentimes leaves little writing time during the weekdays. I come home and often fall asleep with my laptop on my lap (oddly enough) and wake up hours later only to find that my characters may write the story but they can’t type. LOL ! I’m really like a sponge and absorb snippets of information and juicy tidbits as I read and surf the internet. Quite often these pieces will factor into my stories in a way I never would have imagined. My weekdays are very rotish. I wake around 4:30 a.m. and get up about 5:30 a.m. then head to the office shortly after 6:00 a.m. I try to get some writing in while it is quiet and then again at lunch. Once I’m home, I catch up on mail, email, Facebook, and then settle in to write. However, there are days when I know my writing will be something which I will have to revise later, and on those days, I don’t write. I consider it a “recharging the batteries” type of day. I’d have to say emotions. We all know the internal feelings emotions bring to the surface, but when you say emotion, most people think of something intangible but visible. I don’t like to just write that my character is mad. I want to show you she (he) is mad – what is she saying; what are her facial expressions; and just as important, what is her body doing. I want the reader to be deep into the emotional turmoil my characters is experiencing at that moment. Emotions are a head-to-toe internal and external experience and to get the whole sense to the reader is tricky. This short story has turned into the beginning of a trilogy, the title of which is: “Search – Tempting the Fates, Book One”. I expect this to be out in the Fall of 2014. 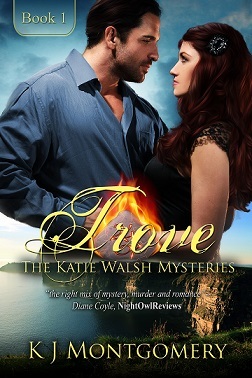 And the sequel to “Trove” which is titled “Harbinger” and is the second book in “The Katie Walsh Mysteries” series should be out by mid-Summer 2014. I’m also co-authoring a paranormal trilogy and book one of this series, “Distracted by Fate,” should be available late Spring 2014. BE SURE TO COME BACK to read more about K J and her release, TROVE, on Wednesday’s Karen’s Killer Book Bench!! Happy Reading! Wow KJ, I learn something new every day. I didn’t know you liked to crochet! Great interview and I’m looking forward to getting my hands on your next release in Feb.
Lovely interview, ladies. I like the sound of your book, Trove, KJ. Please, add my name to the giveaway. I had an instant picture of the skies in NH. My daughter went to Phillips Exeter, and every chance I got I’d go to visit. : ) Especialy loved the fall. Thanks for stopping by, V. Love to crochet. And I hope your enjoy the short story. I had several people tell me that it had to be part of a larger tale…so it’s in the works! I don’t quite have the slip stitch to create a circle down yet, so I stick with “all in one” afghans! Want to give a big shout-out and thank you to Karen Docter for hosting me today and Wednesday…..appreciate the opportunity! !